Has your fine jewelry seen better days? 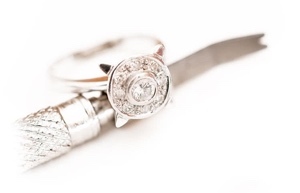 Why not bring your cherished pieces to Nelson Jewelry, where our expert jewelers will make them look as good as new. Is your favorite chain broken, or are the prongs on your engagement ring wearing thin? Perhaps your ring is a bit too loose and needs to be sized. Maybe your white gold ring is looking dull and could use some buffing, polishing, and rhodium plating. Nelson Jewelry can help with whatever you may need. We will evaluate your jewelry and provide you with an estimate at no charge. In addition to that, we will clean and check your jewelry for free. All day, every day. Twice a year, we also have a Remount Event. We like to think of it as ‘repurposing worn or outdated jewelry.’ The jeweler that comes into our store and assists you with a new piece is so knowledgeable that you will leave here with total peace of mind that you made the right decision in resetting your precious and sentimental stones. We are always taking names for appointments, all year long. Perhaps you want to upgrade your diamond. We can give credit towards a new one. Call for more information. Come in for a free repair estimate today!